Web of Science: Why did the great auk become extinct? What was the great auk population in Iceland? 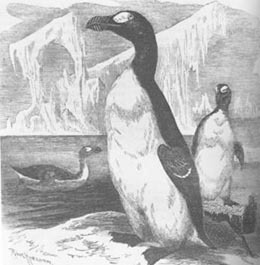 The great auk (Pinguinus impennis) was very common in the North Atlantic in past centuries, particularly off the shores of Iceland, the Faroes, Greenland, the northern isles of the UK, Canada and Norway. It is thought that the species numbered many millions before man began to hunt it in earnest, but it is not clear how many there were in Iceland. Around 1800, the species was under serious threat because of excessive hunting. But it was mainly sailors who hunted them on their long fishing trips in these regions. The bird was large, meaty and easy prey, as it could not fly. The great auk was also hunted for its feathers which were used in the clothing industry. The great auk was a very large bird, at more than 70 cm in length it was by far the largest bird in the Alcae (auk) family. Various other species in this family are common in bird cliffs around the country, such as the razorbill (Alca torda), guillemot (Uria aalga), thick-billed murres (Uria lomvia) and puffin (Fratercula arctica). Excessive hunting was the main cause of their extinction. The last two were taken at Eldey on 4 June 1844 when three Icelandic sailors, Sigurður Ísleifsson, Ketill Ketilsson and Jón Brandsson, were asked to collect a few specimens for the Danish natural history collector, Carl Siemsen. Jón Brandsson and Sigurður Ísleifsson were each quick to find and kill a bird but Ketill returned empty handed, as the two birds killed were the last ones, and that was the end of the story for this penguin of the North. This sad story of the fate of the great auk proves that uncontrolled hunting can wipe out a species in a relatively short space of time. It is worth noting that the Icelandic Institute of Natural History has a stuffed great auk that was bought at a Sothebys auction in London in 1971. There are only 80 such specimens in the world. Jón Már Halldórsson. „Why did the great auk become extinct? What was the great auk population in Iceland?“. The Icelandic Web of Science 16.12.2005. http://why.is/svar.php?id=5489. (Skoðað 21.4.2019).